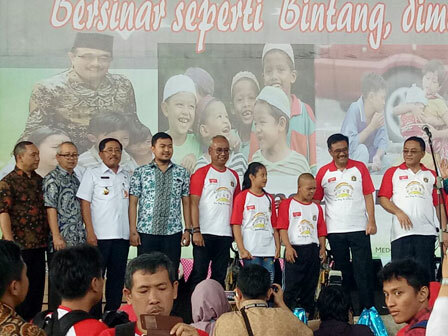 Jakarta Governor, Djarot Saiful Hidayat attended National Children Day (HAN) 2017 together with 1,000 underprivileged children at Dunia Fantasi (Dufan), Ancol, North Jakarta.
" Let us make this National Children Day is not only as a ceremony, but also by doing it concretely "
"Let us make this National Children Day is not only as a ceremony, but also by doing it concretely, but also by doing it concretely. Give them optimism and joy thus they can also have a bright future. I want similar event can be held once a month in here," he said, Wednesday (8/23). Djarot also wants companies to provide corporate social responsibility (CSR) program to invite orphanage to recreation sites. "There are around 7,000 underprivileged children in Jakarta. I hope at least once a month 1,000 children could be invited for free recreation to Dufan in turns," he added. In that event, he gave a quiz for those children. He asked various questions about Jakarta. For those who answered it quickly and correctly, bicycle will be given as prize. Meanwhile, Jakarta Social Dept. Head, Masrokhan added, currently there are around 7,000 underprivileged children in four children social houses, 25 shelter houses, and 50 Child Welfare Institutions (LKSA). "We are still coordinating thus 1,000 children can enter Dufan for free each month. We will involve BUMD in this activity thus it can run smoothly," he closed.